We reproduce herebelow parts of the interview made in March 2016 by Urban Spree Resident Artist Andrea Wan to the zuccaBlogZine. After 4 years in Berlin, the talented HK-born, canadian illustrator speaks in-depth about her education, artistic path, move to Berlin, experience and techniques. Berlin based Visual Artist Andrea Wan, has been an active member of the bustling Berlin art scene for the past four years. She is currently working out of the Urban Spree studios where she commits herself to the wonders of her magical ink techniques, that extend to her dreamlike themes. Andrea Wan // It was back in 2012, I decided that I wanted to move to Europe for a change but didn’t know where. After a visit to Berlin I felt that it’s a potential place to live. I told my Vancouver friend all about Berlin after my first visit here, and one month later she told me that she just quit her job and got her visa to move to Berlin. At that time she had never even been to Berlin before. So after that I made up my mind and felt that I also had to come. I initially moved here with my ex-boyfriend Cyril, who is now also my studio mate. We were really excited about moving here, we didn’t know what to expect it was kinda of a spontaneous choice. The first experiences was that it’s a huge city with a lot to offer, and everything was really new and exciting and very different from back home, just like a new playground to explore. After 4 years I still love it here and want to stay longer. zBZ // How has the German language effected or influenced your daily life here in Berlin? How do you find Berlin as a city to live and work in? Andrea Wan // I think because I’m a freelancer that makes it easier, to not be able to speak the language, right away and Im still in the process of learning German. It kinda gets in the way, everyday, but it’s not a huge problem for me right now. Living and working here is very flexible because it’s a very laid back city, filled with a lot of musicians, artists, freelancers and writers. I find that this city pushes you to focus on yourself and really think about what you want, without external influences. And, also there’s a sense of freedom here. I want to be able to speak German though it’s going to take quite a while, because whilst having a job, it’s hard for me to split the time. Ideally, I would want to have proper conversations with people in German. In less than 10 days, opens the first Berlin solo show of our Urban Spree resident artist Andrea Wan at BC Gallery in Friedrichshain: “Fleeting Seasons” is a body of amazing new works by Andrea, mostly inks & watercolors on paper, mainly large formats. Not to be missed! Opening on January 15th, 18:00. 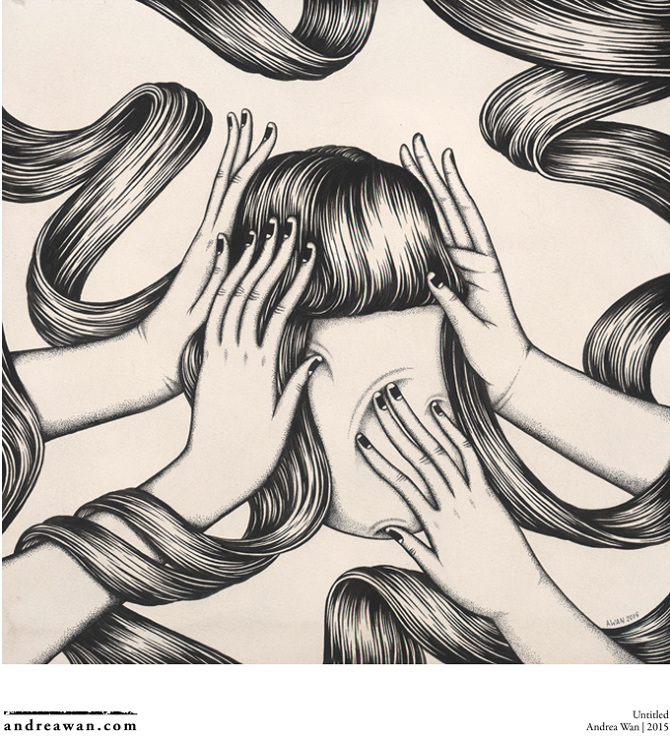 Urban Spree’s Resident Artist Andrea Wan has a solo show opening on April 10th in Vienna. The exhibition is taking place at the Rabbit Eye Movement Art Space, managed by Nychos (who is actually coming to Urban Spree to paint the main wall at the end of April). If you are in Vienna, the show is on until May 8th, 2014. Don’t miss it! Urban Spree resident artist Andrea Wan is presenting a new body of eerie drawings as part of the Pictoplasma Character Walk 2013 in Berlin. Andrea Wan will be exhibiting her new works at Sur la Montagne Gallery (Torstrasse 170) in a show titled ‘Fakelore’. Andrea will also be giving a talk at the Pictoplasma Conference at The Babylon Theatre on April 11th at 15:30, followed by an art session at the Platoon Kunsthalle. Last but not the least, Andrea will be also curating the visuals section of the Post-Picto-Party on April 13th at Urban Spree, in a playful, old school graphic intervention (Andrea Wan & Friends). Starting on Sept. 20th, 2012, Urban Spree’s artist resident Andrea Wan will be exhibiting some new work in Hamburg together with Daniel Van Der Noon. Her show ‘Hamburgers’ is taking place at ‘Die Gesellschaft’ on Karolinenstraße. Andrea will also participate at the Reeperbahn Festival on the 22nd with a live painting session. As we always love to sneak into her atelier, we could witness the drawings she has prepared for her exhibition and you will be whooshed are sure as we were. Andrea Wan is a canadian artist and illustrator from Vancouver that currently lives in Berlin.